“The secret of life is to have a task; something you devote your entire life to, something you bring everything to, every minute of the day for the rest of your life,” said Henry Spencer Moore. And indeed, these were words that the artist responsible for pioneering a very particular form of British Modernist art lived by – his extensive and enduring legacy certainly testament to this fact, anyway. 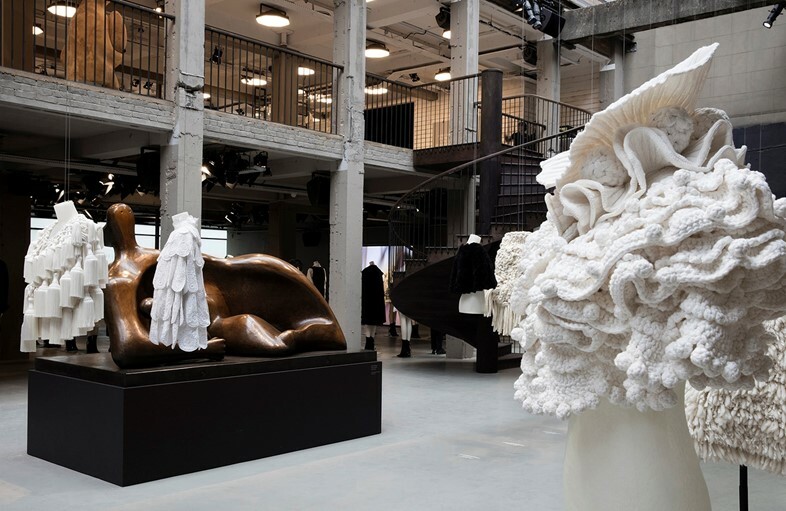 For Burberry’s S/S17 collection, Christopher Bailey drew upon the oeuvre of Moore to sartorial effect, with clothes structured to mirror the curved and punctured forms of his renowned sculpture, alongside an exhibition at Makers House celebrating his work. So, to pay our own homage to the iconic artist, we’ve compiled a list of ten facts about him you need to know. 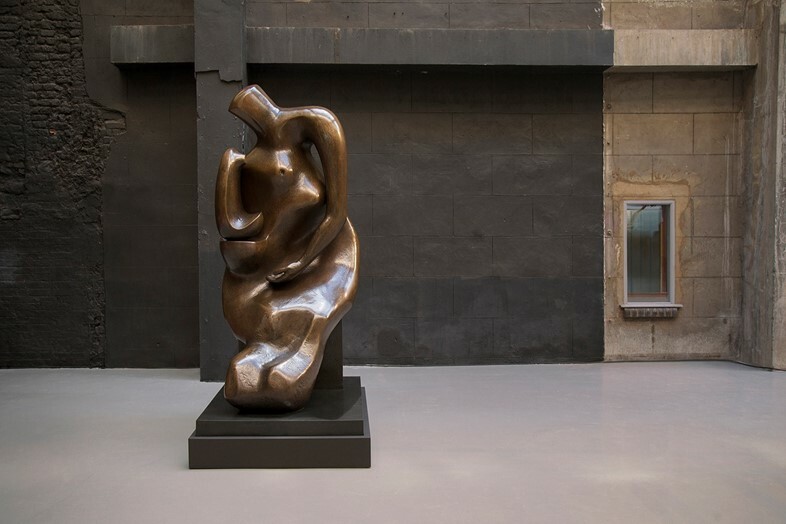 Born in Castleford, Yorkshire (another fact: Burberry’s trench coat production actually started in this very town during the 1880s), Henry Moore was the 7th of eight children in a family that often struggled with poverty. He professed to have decided to become a sculptor when he was 11 years old after hearing of Michelangelo’s achievements at a Sunday School reading. 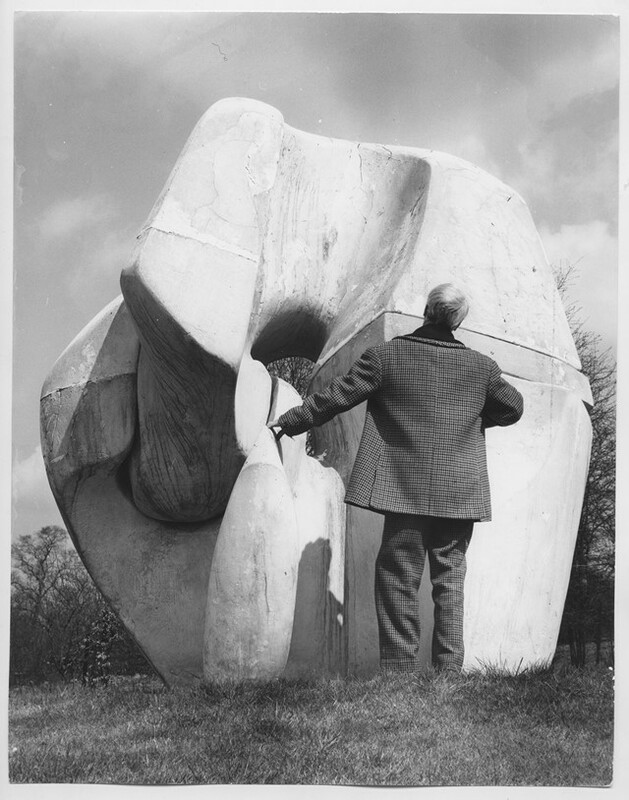 In 1921, Moore won a scholarship to study at the Royal College of Art alongside Barbara Hepworth. While a student, Moore emerged as an artist of note on the London art scene and three years later, he took part in his first group exhibition at the Redfern Gallery. Moore’s first public commission titled West Wind (1928) can still be seen at St James’s Park Underground station to this day. A figurative carving in Portland stone, this work was assigned to Moore after a recommendation from Jacob Epstein. 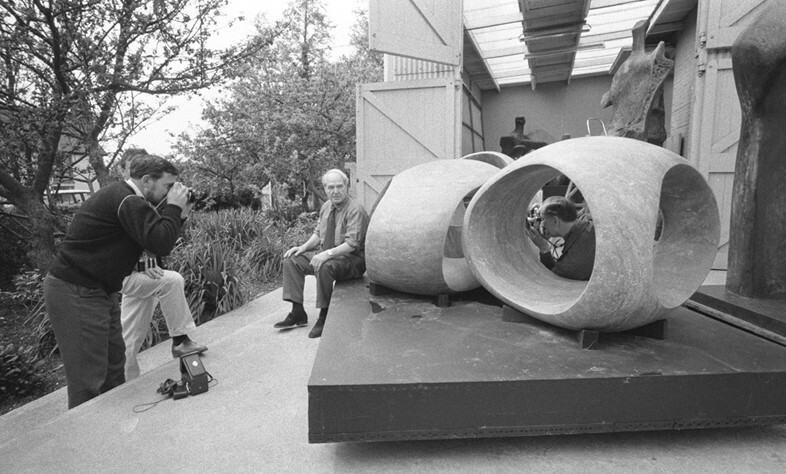 The commission helped to propel Moore’s respected status amongst the British avant-garde. In July 1929, Moore married Irina Radetsky, a Painting student at the Royal College. Shortly afterwards, the couple moved to a studio in Hampstead at 11a Parkhill Road NW3, joining a troupe of avant-garde artists (including Barbara Hepworth, Roland Penrose, Naum Gabo and art writer Herbert Read) who were also living there at the time. After their London home was hit by bomb shrapnel in WW2, the couple moved out of the city to live in a rural farmhouse in Hertfordshire. This became Moore’s home and workshop for the rest of his life. In 1946 Henry and Irina’s only child, Mary, was born. 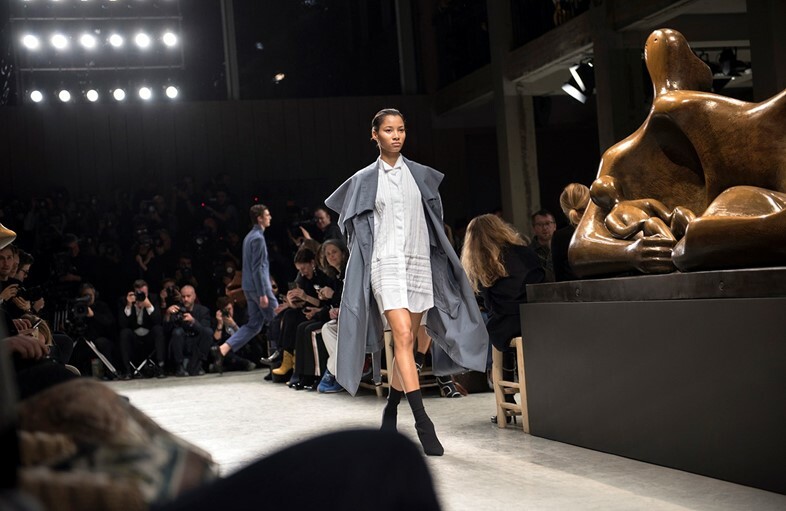 Mary Moore was instrumental in advising Christopher Bailey on her father’s archive for Burberry’s recent show and exhibition. 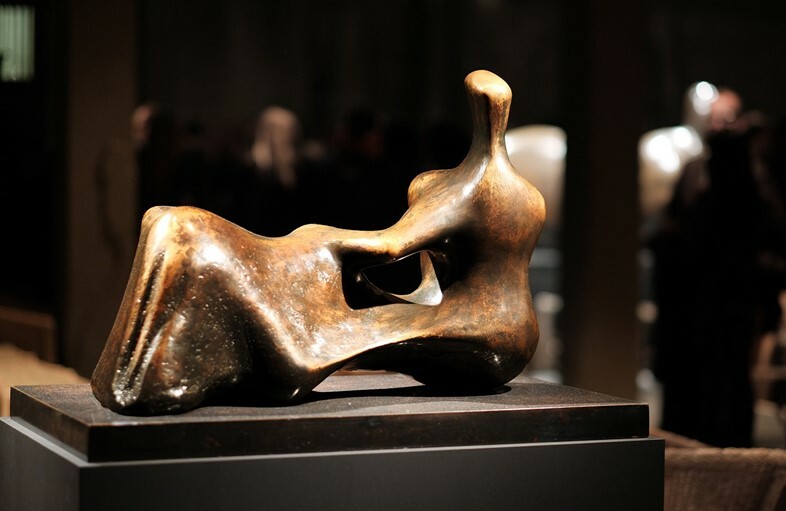 In 1926, Moore began work on the first of his pieces depicting reclining women. He was also carving a variety of subjects in stone, mother-and-child groups, masks and heads. 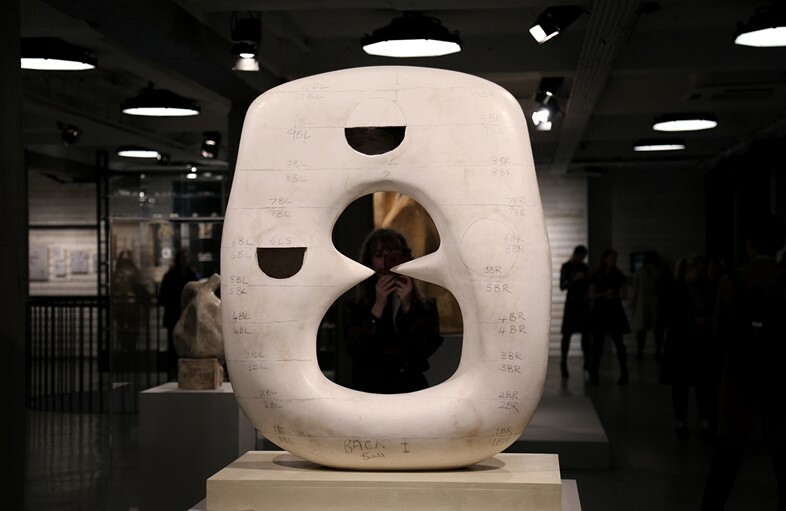 Though certain works show his awareness of the Cubist movement and work of Constantin Brancusi, the most important influence on Moore’s practice at this time was that of ancient Mexican stone carving. In 1931 Moore decided to resign from teaching at the Royal College of Art after he – for want of a better phrase – was ‘ganged up on’ by his colleagues. In the same year, he became the first Head of Sculpture at Chelsea School of Art and held this post until the outbreak of war in 1939. One example of Moore’s politics was his response to the use of Tube stations as bomb shelters during WW2. Working class people had fought – and won the rights – to use the spaces. Henry Moore produced a haunting series of drawings from memory in response to these people tightly packed in rows in the underground tunnels. In the same year that Moore was offered this rejected knighthood, the Festival of Britain was organised by the Labour government to promote the arts and to encourage post-war optimism. 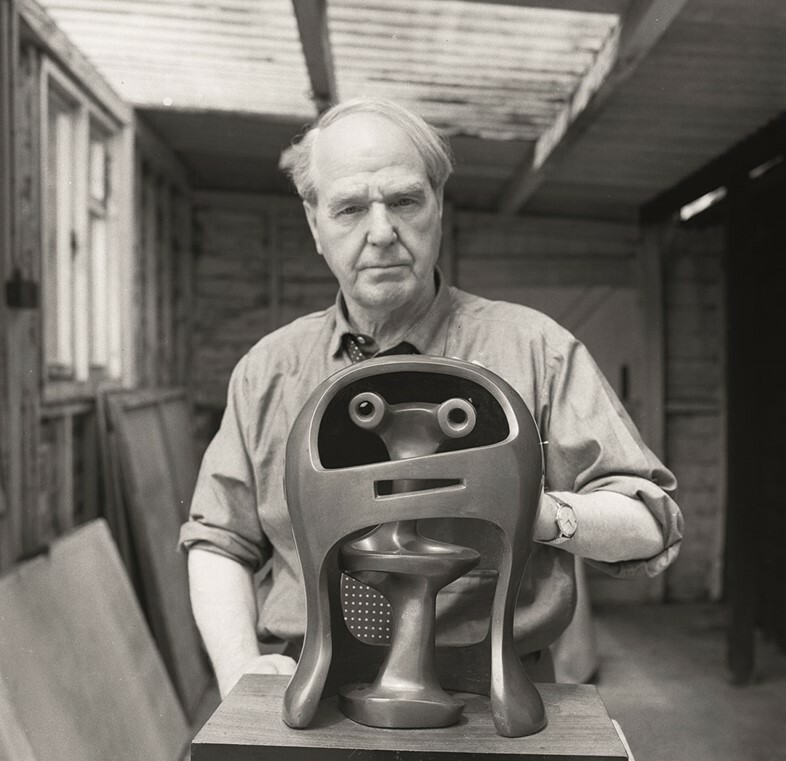 To coincide with the festival, John Read produced a documentary titled Henry Moore for the BBC, making him the first living artist to be the subject of a film.